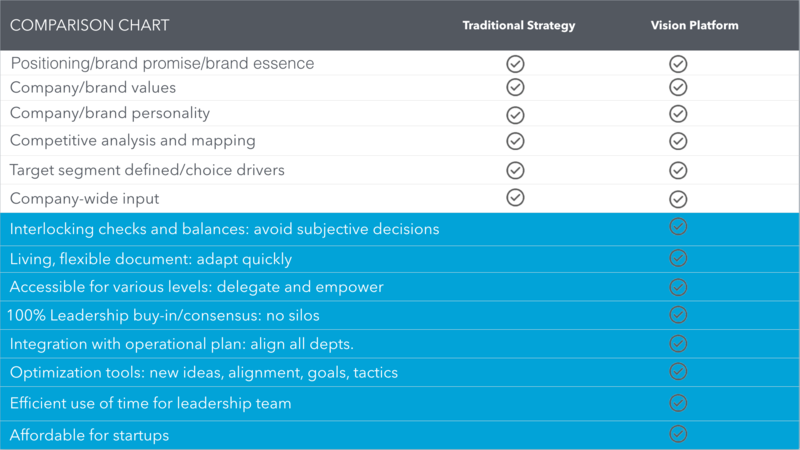 Do you have a comparison chart showing the difference between Vision Platform and traditional methods? What will our Vision Platform include? What will happen if the core leadership team does not complete the survey on schedule? If anyone on the core leadership team is choosing not to fill it out, they should make an informed decision. The risk of the core leadership team not completing the survey will be that we may not be able to finish in the time we have scheduled. This may incur additional cost to reschedule. What is a core leadership team? Those that attend the Vision Platform Generator work session are called the core leadership team. These are the people who make decisions that shape the soul of the organization. This is typically no more than seven people no matter how large the organization is. They all must attend the Vision Platform Generator session, but no others should attend. What are the technology and logistical requirements for an in-person Vision Generator session? 5) It would be smart to remind everyone they need to commit to the entire day, including a working lunch. There will be a few short breaks to catch on a call or email. I wouldn’t recommend starting any later than 9AM. 8AM is event better. It’s your call. What are the steps to develop a Vision Platform? We need to work with someone to identify top trends and issues in your industry, your target audience(s), names of top competitors, identify the core leadership team, and the email addresses for those responding to surveys. This will prepare us so we can send out the surveys. A.) Two weeks before our work session with your leadership team we’ll send out a link to the comprehensive online survey for up to five members of your core leadership team. It will likely take an hour to complete. B.) We will also send an additional, short survey to up to five people who know your potential clients or organization well. Those who attend the Vision Platform Generator work session are called the core leadership team. These are the people who make decisions that shape the soul of the organization. This is typically no more than seven people no matter how large the organization is. They all must attend the Vision Platform Generator session, but no others should attend. When everything is important, nothing is important. Organizations won’t execute well when they don’t prioritize well. The next step is a two- to three-hour strategic planning session based on the organization’s Vision Platform and facilitated by your dedicated expert. The same leadership team will prepare by filling out an online survey and then meet together to set their 3-year, 1-year, and 90-day goals, utilizing Vision Platform’s goal tracker. What do we need to provide for the work sessions “We should have a conference room with normal conference table setting (not a u-shape or classroom style) reserved for up to ten hours in case we run over. Windows with an inspiring view can help everyone remain energized throughout the day. A location with no potential interruption is optimal, because we all need to be present for each section. If one of the core team needs to leave the room, we all need to stop and wait for that person to return. Why do most new initiatives fail? The failure of new initiatives is due to a few factors which Vision Platform solves and traditional methods do not. There are three main factors why traditional methods fail and why the core leadership team needs to be in the same room together. 1) The core leadership team doesn’t agree on how they define their company, where they are going in the future, and what makes them the best choice for those who buy their products or services. Which means without the core leadership team in the room there will not be agreement and therefore no alignment throughout the company, which leads to failure on some level and wasted resources. 2) Traditionally, creating a vision takes too long (weeks or months) causing the issues or decisions to become fragmented in the minds of the leaders. We do it all in one day so the leaders can get their head wrapped around all the factors that need to be considered to create a solid vision. We need all the leaders in the room for that day. 3) The decisions about the company vision are not trusted ( and therefore not followed) because they were not rigorously challenged when they were made. That’s why the leadership team must all say yes to challenging questions at the end of each crucial decision before moving on. Without the core leadership team in the same room, there is no way to get everyone’s doubts or concerns on the table. Without creating a high level of confidence in the vision, the company will not choose to fallow it and instead wander off in other directions, again wasting resources and creating failure on some level. Why will my core leadership team have to be in the room for one day? The core leadership team needs to attend the entire work session because the process creates consensus around fifteen points that drive the company forward. This means those who make decisions that shape the company must be in the room to create the vision. What we help them create will shape, not only the brand, but establishes decision criteria for all aspects of the company. An authentic brand is not separate from who the company is at its core and where it’s going. Which organizations should not use Vision Platform? Caution. This section offers a little raw truth. If your leadership style is based on any of these principles, the Vision Platform will not fit your company culture. It’s important to cluster the power at the top. If you clearly articulate and share a Vision Platform, all levels of leadership will be able to execute quickly. The downside is everyone from the top to the bottom will be working toward the same vision. This diversifies power, creates accountability, and may not be desired. The excitement of random ideas is paramount. Many idea people feel limited by working toward tangible long-term goals. Sometimes entrepreneurs are not aware that their biggest strength as passionate idea people can also be their biggest weakness unless it’s subject to a little discipline. Our process offers a little discipline when it comes to choosing strategies and tactics. The company already has some sense of what it is and what needs to be done to reach its goals, and that is enough. Executing a loose plan can work if you have extra resources and you can afford to waste some. The waste often comes from executing based on vague guidelines rather than articulating crucial elements, making those elements available to the leaders company-wide, and having the confidence that no one is jumping to unsound conclusions. Some leaders believe that being responsive to the market excludes them from following guidelines. Many have never seen how a flexible, yet focused, Vision Platform can fuel change rather than hinder it. Unless they are open to developing a dynamic Vision Platform, they might be correct. Business analysis and outside research are the most important requirements to ensure success. This belief has created many non-repeatable success stories, leading to great ideas that are not subject to a larger Vision Platform, which in turn encourages random executions and false starts. Many companies are not aware of the benefits of combining a Vision Platform with business analysis and/or research. What if we already have some of these things in place? We can use what you have. Most companies love the rigorous checks built into the process which helps them tune up what they already have. If you are absolutely set on a few of these elements we can simply review what you have established and skip that exercise. We solve the issues traditional methods can’t: create consensus, includes a solid position in the market, offers a dynamic way to manage the vision in a shifting market, the process requires authentic and specific conclusions, rapid vision generation. The reason strategic vision is often not adhered to is the leadership team didn’t attain consensus, which means silos remain intact, creating fractures in execution. Another reason executions are fractured is that once a strategy is created the market tends to keep shifting quickly making the previous strategy outdated in just a few months. Instead of it taking six months and $60K we do it in ONE DAY! Only if you feel you may be wasting resources and want better results. If you want to start a new brand or marketing effort. If you need to transition from one leadership team to another. If you need to get your leadership on the same page and executing efficiently. If you want to set your company up to reach the next level. If you want to improve company culture. We know you may have done this type of exercise and think it’s a waste of time. We make it useful because it’s not the same old traditional approach. This took us 15 years to perfect. You will want to check out the “Why Vision Platform” page to see the senior people who have been through similar processes but who had an exceptional experience and results. Over 100 companies have been run through this method with ridiculous case studies like 289% growth in 10 months (Volant), 24% jump in sales in a saturated market with a well-trained sales team, one client wrote their entire business plan in one day, another raised $6M because of the clarity they had. Everyone who uses it is thrilled about recommending it. We’re happy to give you contact information for references. Will this enhance client/boss relationship or company morale? It’s a bonding, harmonizing, and inspiring experience. You will get all the major issues on the table and discuss solutions. You will leave equipped with decision-making criteria the leadership team agrees upon for your major hurdles.